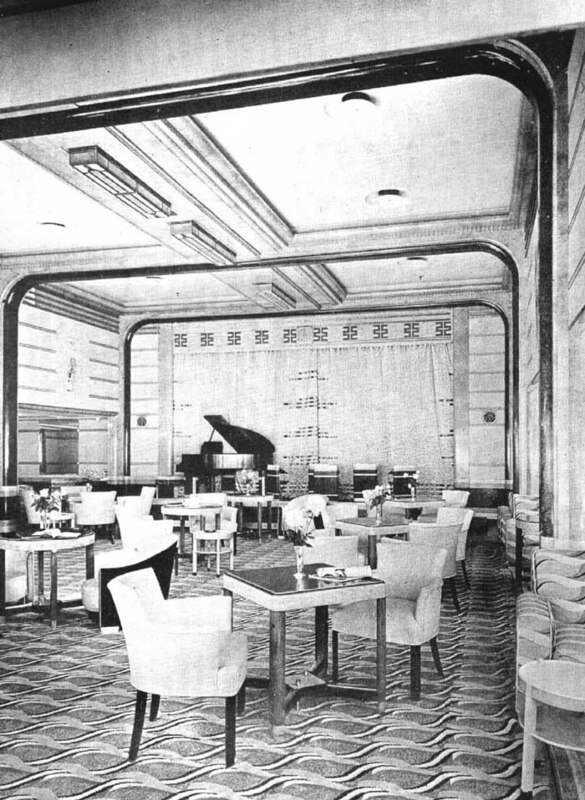 The second class main lounge  as designed and seen in original 1936 Stewart Bale photographs, was one of the smartest and most contemporary interiors on the Queen Mary. Located on M deck just aft of the second class grand staircase, (and across the broad crosswalk from the second class library and writing room, cocktail lounge and children's playroom), it was not simply a pared down version of the first class lounge, but had a gaiety and style all of its own. 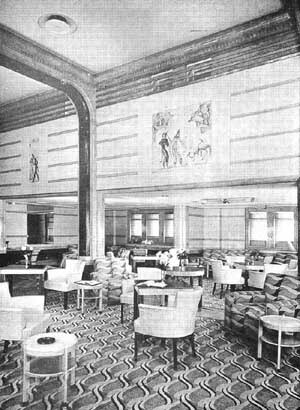 The high style and elegance of the appointments were the result of Cunard White Star's decision to make second class accommodations on the Queen Mary better than those on all competing ships on the North Atlantic -- including the fabled S.S. Normandie. "The arrangements for entertainment are on a scale never previously attempted [in second class]. The room is of imposing proportions, the length being 80ft., the width 70ft., and the centre space over the dancing floor 16ft. in height. 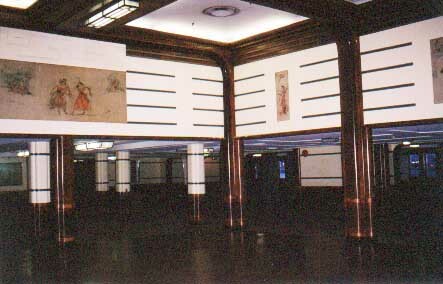 The dance floor, in parquet, measures 33ft. long by 28ft. wide. The floor treatment consists of a large centrepiece, in which lines of oak and walnut radiate from octagonal oak panels to form a composite pattern covering the whole area. The stage at the after end is 20ft. long with a depth of 8ft. from front to rear, and a proscenium 27ft. wide by 16ft. high. The curtains of the stage are in silver and green. A large cinema screen and the latest sound-film equipment are provided. When arranged as a cinema, the lounge has accommodation for an audience of 388 persons, while in normal use there is seating capacity for 210. A full equipment of colour-changing effects, spotlights and footlights are incorporated in the theatre lighting system, and the decorative effects are greatly enhanced by the use of beautiful silver and wax flowers ornamenting the stage. Jardinieres with fresh flowers are arranged in front of the stage. The general lighting of the room is from concealed cornice fittings over the dance floor, and from ceiling fittings at the sides. A most charming colour combination in green, ivory and silver is achieved in applique leather for all the upper wall surfaces above a dado of selected Thuya burr, figured birch and maple, with a skirting in black rubber. A horizontal striped design gives the walls a touch of gaiety, which balances the more serious and practical leather furniture with which [the occasional furniture in] the salon is equipped. to the design of the same artist. There are 28 windows in the room, all framed in silver-bronze metal. The floor is entirely covered with thick Wilton carpets, laid over 3/8in. cork supplied by the Korkoid Company, while a large rug is provided for the dance floor when not in use for that purpose. 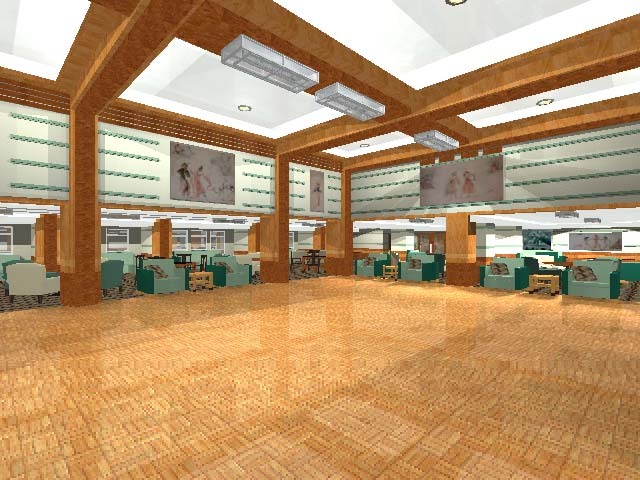 The furniture in amboyna and Macassar ebony, and upholstered in green, cream and black materials, includes a wide range of easy chairs and settees, card and periodical tables, and fitted writing tables, arranged in recesses. A special type of cinema chair, designed both for comfort and easy stacking, is provided when the room is being employed for this purpose. The decorative contract for the tourist-class main lounge as well as the library and writing room, was carried out by Messrs. Trollope & Sons, of London. 1936-1939 - used as the center of tourist class social life on the Queen Mary. 1940-1946 - the Queen Mary was used as a troop transport. 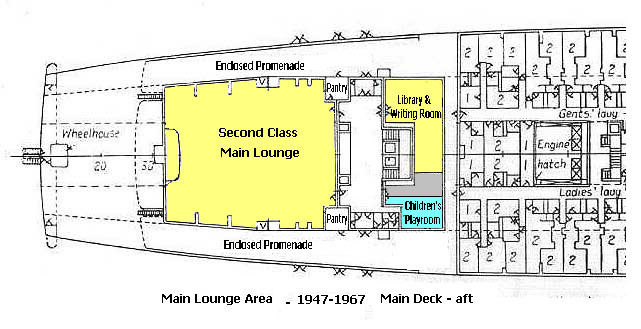 1947-1967 - restored to original function, (called cabin class after WWII), with a new, more sober color scheme and atmosphere. Late in her ocean going career, the Queen Mary served more frequently as a single class cruise liner in winter months. To differentiate the second class lounge from the first class main lounge in mood and décor as well as function a themed décor was installed. 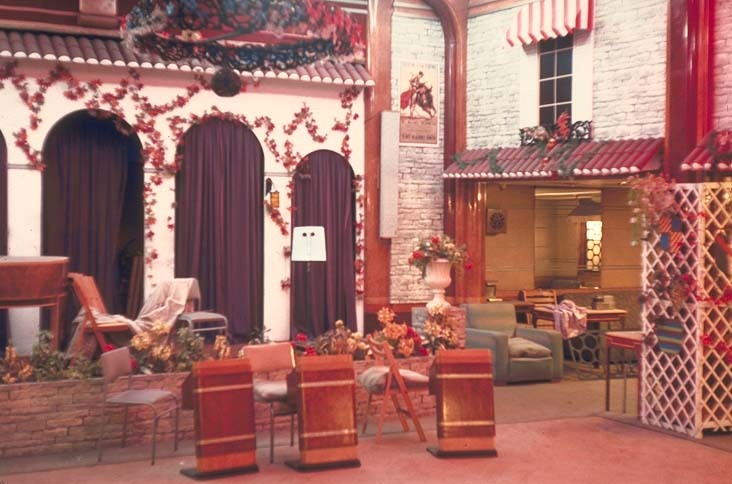 The Margot Gilbert history of dance murals were covered over with Spanish style windows, awnings and flower boxes to create what was called the "Flamenco Room." 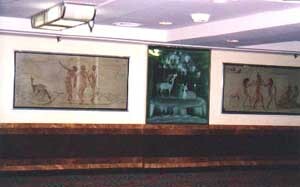 It was with this themed décor that the room arrived in Long Beach. 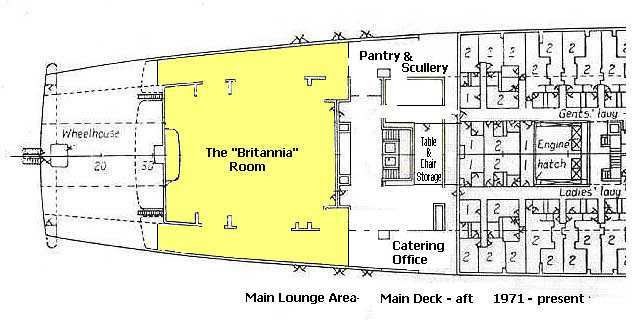 1968 to present - Diner’s Club, the initial general lessee for all commercial services aboard the Queen Mary planned to use this room as a nightclub. 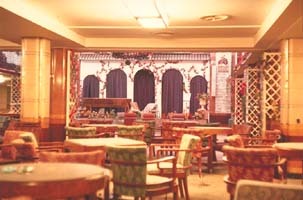 The "Flamenco Room" decor was stripped away for partial restoration of the prewar decor. Diner’s Club left prior to the opening of the ship in 1971. 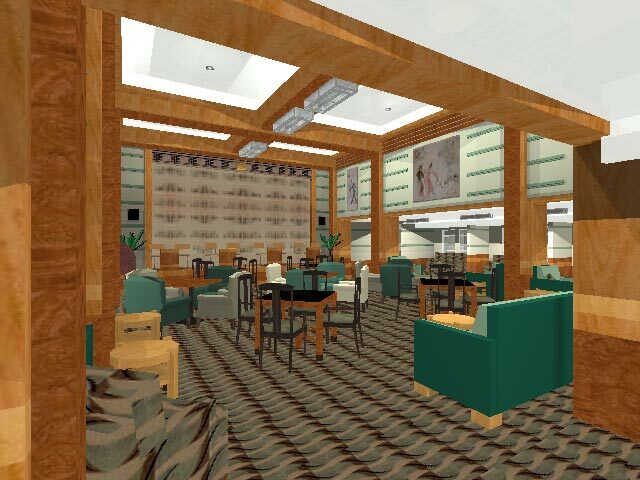 The new lessee abandoned Diner's Club's ambitious hotel plans and assigned the room, now minus all furnishings for banqueting service use - where it remains to this day. The outboard walls were partially gutted to expand the square footage. This created the somewhat undefined room that we see today. While the upper walls and the Margot Gilbert murals were restored, the vastly expanded chair and table storage and pantry/scullery requirements required for banqueting has done serious damage done to the adjacent library and writing room. The nearby second class childrens playroom was entirely removed in the conversion. This room is routinely "restored" every ten years or so. This usually means a new coat of paint, replaced walled to wall carpeting and repairs to the damaged wall surfaces caused by the frequent movement in and out of banqueting tables and chairs. The most recent effort was completed in 1999 by the current lessee and was carefully executed. Circa 1999 - after the most recent repairs to walls and paneling. For the Queen Mary to create a meaningful shipboard experience for hotel guests and others a series of attractive amenities and activities of interest must be made available to these patrons. Since the Queen Mary is docked in port, guests are not a captive audience. Unlike passengers when the ship was at sea, they can exit at will for tourist excursions and business activities. To support the range of amenities required for a meaningful shipboard experience a broader audience then that supplied by the occupants of the 300 full sized cabin shipboard hotel is essential. (There were 2,000 passengers when the ship was at sea.) Creating a social and business club to share in the use and support of these amenities is essential. The light use of the "Capstan Room" when reserved for hotel guests in the 1980s and early 1990s supports the perspective that a series of attractive amenities are required. 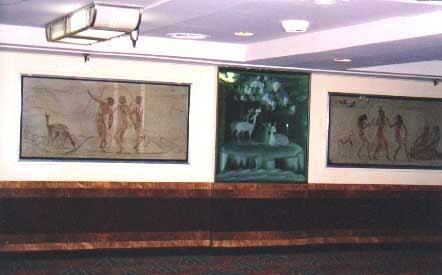 This somewhat squat, dark and uninviting room and the barren deck behind it were used in a half-hearted attempt to create a social center of shipboard life for hotel guests. Few services were available. The hotel guest response was less than overwhelming. The performance of the recent business luncheon club that was briefly housed in the Chelsea Restaurant on the enclosed starboard on promenade deck indicates that calling a restaurant a club does not by itself create a meaningful club experience. For a social and a business club to succeed today more than a good dining room and kitchen are required. 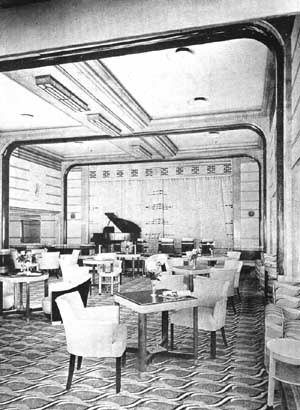 We believe that the combination of a spacious and elegant lounge, a library, a writing room, a reserved dining room with an outstanding and daily changing menu, and a spa complex with both an indoor and possibly an outdoor pool, a gymnasium and as well as small conference rooms would create a shipboard experience that is satisfying both for hotel guests and club members. 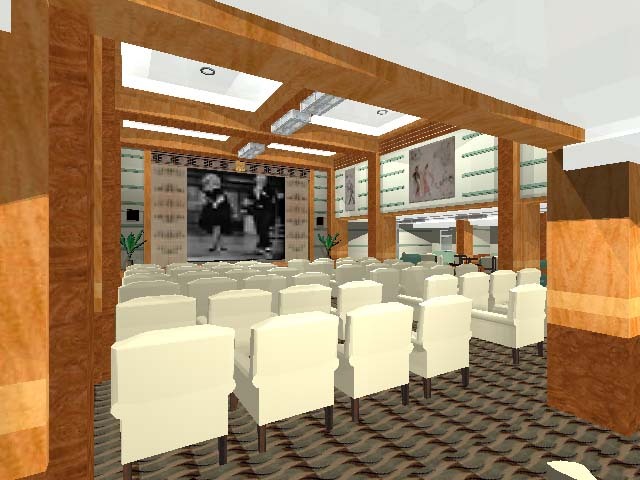 Thus the second class main lounge might become the salon where the leaders of Southern California meet their guests and business associates in a setting shared with hotel guests from around the world. The full restoration of the second class main lounge and adjacent areas as illustrated below would be an essential ingredient in this business strategy, and this room might once again be used as a social gathering place, a venue for showing films, holding afternoon tea and evening entertainment. 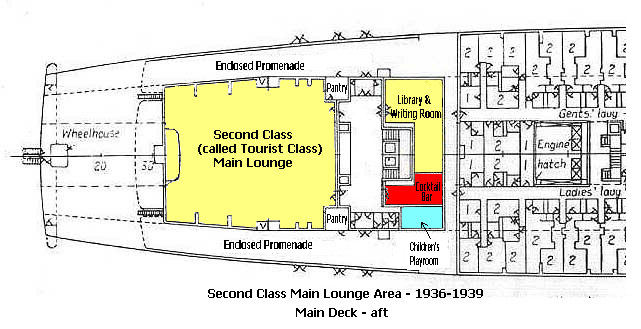 The Second Class Lounge set up as a cinema.